With a cold frame, you can extend your growing season by about two months. You can plant crops a month earlier and harvest a month later than when they are outdoors. 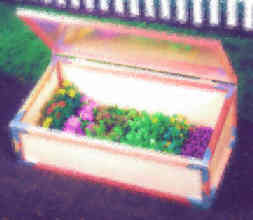 A cold frame is basically a box to protect plants with a transparent (glass or plastic) lid to allow light in. People tend to build cold frames of whatever materials are handy. Cold frames come in all shapes and sizes, but most people build them around 2 feet by 4 feet. Cold frames also are often found with an angled roof to trap more sunlight and to allow rain and melted snow to run off more easily. You can choose to grow cold-frame plants in pots for later transplanting or plant right in the soil. The temperature inside the cold frame should stay below 25C degrees. Once nightime temperatures are above 10C you can remove the glass roof for the summer. During the transition when the nights are cool but the days warm, you can prop open the glass roof every day or buy automatic venting devices available from most gardening stores. You can buy complete cold frame kits from most garden supply stores. The web is a great place to look too.Cold Frames start from a few pounds or dollars for the cheapest. Individual plants can be covered with a plastic bottle where the bottom has been sawn off to create an individual cold frame for that plant.